Rewind the clock back to 1995, a time that will live long in the history of a nation. A land that was divided by hatred was ultimately united in sport. One man used the universal language of sport to unify his people. That man was Nelson Mandela. When Mandela stood on that podium after he had been elected the first black president in South Africa’s history in 1994, many doubted when he promised to unite his fellow countrymen. Even fewer would have believed that he would use his love of rugby to do it. South Africa hosted the Rugby World Cup in 1995, and they would go on to win it – beating New Zealand 15-12 in the final. That very game was more than just a game of rugby; it helped solidify the end of segregation in the country (Apartheid), and from it emerged democracy. Rugby was a game for the white in South Africa, and only one member of the squad was non-white. 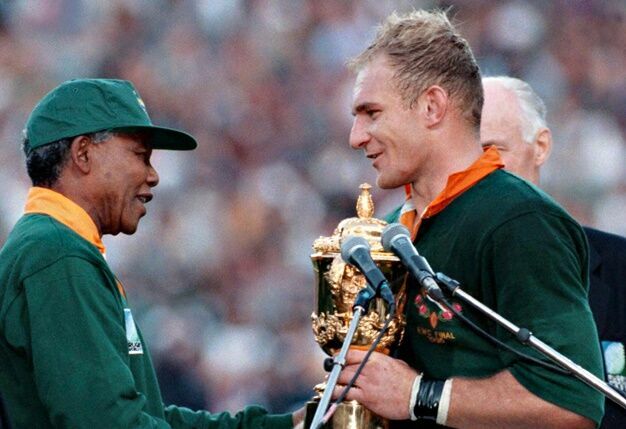 But when Mandela stepped out in front of 65,000 people in Johannesburg to hand the Web Ellis trophy to South African captain Francois Pienaar, it was a nation defining moment. A country divided politically and economically, much of which was fuelled by racial tension, came together as one through sport; in what was one of the most iconic and powerful photos in sporting history. It’s no coincidence that the song so synonymous with rugby is titled ‘The World in Union’. And as the lyrics go: “I will fight what I can beat, if I win, lose or draw, there’s a winner in us all,” Mandela’s message is echoed. Ireland crashed out of the Rugby World cup on Sunday, but the Irish rugby union team is one of the few mainstream sporting unities this island shares. Like South Africa, Ireland was divided. Nationalists and Unionists have quarrelled for years on this island, and that political divide still exists today with the six counties that make up Northern Ireland, which remains part of the United Kingdom. But the island of Ireland remains one in terms of rugby, and together they travelled shoulder to shoulder through adversity in the tournament. Religious and political divides are forgotten and the island rejoiced to the sound of ‘Ireland’s Call’. Sport for so many, means so many things. For some it’s a hobby, for others it’s a competition. But there aren’t many things in the world that can exude so many emotions as sport can.